TouchIT Interactive Flat Panel LEDs are the latest interactive teaching tools for the modern, connected, interactive classroom. Our Interactive Flat Panels allow the teacher to create and show any content on the screen to the class from their computer. They can then connect students on their devices to the LED for interactive and collaborative lessons. With a high resolution and low glare image, even the smallest of text is easy to read on the LED. Multi-touch allows the teacher to control and annotate over any application that is running on their PC, MAC or Chrome OS directly from the screen. You can even use gestures to control your applications. The TouchIT Fusion 2 is the future of interactivity. Available for TouchIT LED Y Series LED Displays in 55”, 65” and 75”, the TouchIT Fusion 2 is three products in one! 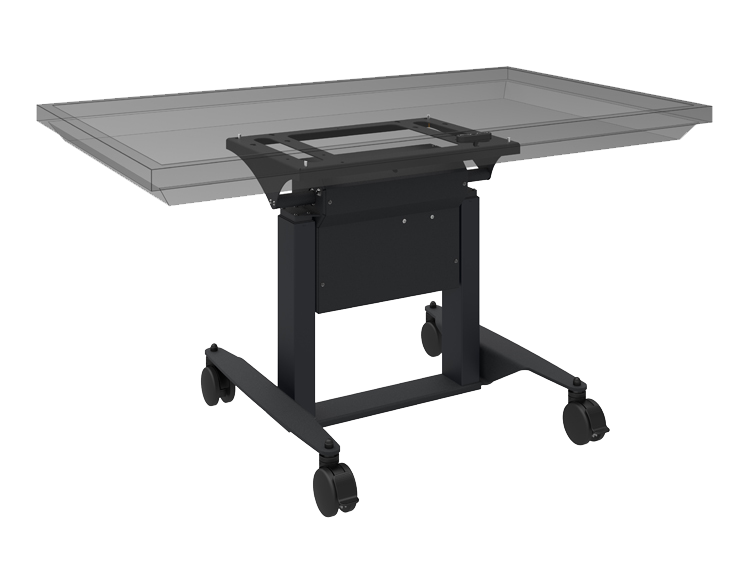 An Interactive Easel, an Interactive Table and an Interactive LED – Choose how you want to use the product at the touch of a button – perfect for any interactive classroom. Ideal for cluster group learning. Is everyone the same height? The answer is of course not! 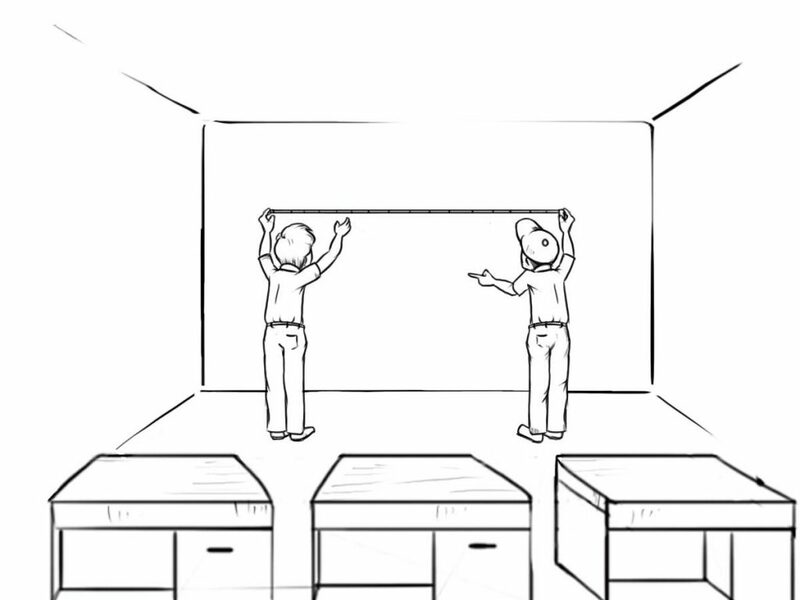 Therefore, how do you choose the optimal height to mount your TouchIT LED? This is always a difficult question so what the BalanceBox range does is that it allows you almost 16” or 40cm of height adjustment. With little to no effort, you can raise and lower even the largest of our touchscreens. This height adjustment is perfect for being able to allow teachers and students of different heights access to all parts of the the touchscreen. To the inexperienced, a TV and a touch overlay would seem to present a school with an inexpensive option for an Interactive Flat Panel, but this really doesn’t work. An overlay is a second piece of technology that lays on the screen of a regular TV or monitor to create a touch screen. The problem with this technology is that while it may be cheaper than a fully integrated unit – by integrated we mean that the touch component as well as the screen are all in one – the experience that you get as a user is not good. First, there is a problem with accuracy due to something called a large parallax. A parallax refers to the amount of space there is between your finger or pen pointing at the screen and where the cursor is displayed on the screen. With the larger parallax you get when using an overlay, this causes problems when you try to do things that require great accuracy – manipulating an Excel sheet for example. It’s hard to have accuracy with an overlay. Think of how many times on NBC’s Monday Night Football you see the presenters touching the same player two or three times to try and move him around. This is because of the large parallax on their screen. Second, the overlays never seem to actually fit the screen properly. This causes problems as the screen and overlay get out of sync. You need to recalibrate often to regain the accuracy – rather like with the Interactive Whiteboards you are looking to replace! Infra-Red and Surface Light Wave Technology are two of the most common touch technologies found on Interactive Flat Panels today. The way they work is by casting an invisible grid across the surface of the panel. When you touch the screen, you break the infra-red line of sight across the X and the Y axis creating a coordinate. The computer converts this coordinate into a mouse position. This is how you control the computer from the screen. Infra-Red is also good for multi-touch input as it accurately tracks the multiple mouse positions. The technology is incredibly fast and accurate and it is not humanly possible to move your finger quicker than the technology can track. This technology is not pressure sensitive so you don’t need to press hard on the surface. PCAP or Projected Capacitive technology is a totally flat “iPad like” surface. This is very much the future of the Interactive Flat Panel as the technology is very responsive and the flat surface provides a fantastic user experience when using the touch screen. The problem is that the technology is really just now being used for larger screens so is very expensive. You are looking at somewhere between one and half to twice the cost of the same sized infra-red touch unit. This will put PCAP out of range of most education budgets at this time. There are a number of other technologies out there. Five and Seven wire resistive technology as well as Surface Acoustic Waves (SAW). These technologies are really not suited to the large screen and are much more accustomed for smaller monitors of 24” or below. They are also not great for touch-based annotation (with a finger or pen) and are more commonly found on Point of Sale (POS) machines where you are simply registering clicks on an unchanging screen – such as you would find at the checkout of a grocery store or in a restaurant. Commercial Grade LED over Consumer Grade LED – What’s the difference? When selecting your Interactive Flat Panel, you do need to make sure that you are buying a Commercial Grade Panel. There are two types of physical LED panels on the market (this is the bit that creates the image on the screen), Commercial and Consumer. The difference between the two really boils down to where and how often it’s being used? For example, when you buy a TV for your house, it is not going to be running seven days a week, 24 hours a day – unless you have a serious Netflix addiction. If you did run your TV this often, you would definitely invalidate your warranty. TV manufacturers actually expect that the TV gets to have a rest for several hours a day and is only used for a few hours of continuous use. Usage expectations are different for a Commercial grade product. A Commercial Grade LED is designed and rated to be used for much longer periods of time. Some manufacturers such as TouchIT Technologies actually rate their product for continuous 24/7 usage. When the Interactive Flat Panel is going to be on for extended periods of time during the school day, this is important. With a commercial grade LED you also get a Commercial Grade Warranty. This for example is an on-site warranty where if something goes wrong with the LED, the manufacturer sends out a technician to your school and they fix the product there at your location. This is very different from the warranty that comes from the average retail store. We do cover warranties and the different types of warranty later in the eBook. 2. How do you choose a brand? Also, what I find particularly interesting about this, is that the market has really been dominated by non-household names and only of late have the likes of Microsoft and Google entered the market ̶ albeit with incredibly expensive products! What you do need to remember is that there are a limited number of physical LED panel manufacturers in the world; so the underlying display technologies for many of the manufacturers of Interactive Flat Panels is actually the same. This is why you need to be looking at the overall package. Here’s my question check list for comparing manufacturers. What operating systems do they support? Software offerings vary dramatically. You should at least get some form of annotation software but you should be looking for more than this. What education content do they have available? Do they have any free resources you can download? What tools do they have for the classroom? Are there any ongoing software costs? This is a big question as we’ve seen a couple of manufacturers change their pricing policy to an annual subscription model. This means you will continue to pay year after year and this also means you will need to find that money from somewhere or risk losing the software. Do they support BYOD / Classroom Collaboration? Depending on your strategy for hardware in the classroom, you may wish to look for their support of BYOD and collaboration. The BYOD or Bring Your Own Device initiative encourages users to bring their own tablet or laptop to interact with the Interactive Flat Panel. Look for support for MAC, Windows, tablets, both Android and IOS, and be certain to ask about Chrome OS. Chromebooks, due to their lower price tag, are becoming increasingly popular in the classroom. Unfortunately, due to the Chromebook’s lower quality and lower processing capabilities, they prove a challenge for some manufacturers to support. Is the Interactive Flat Panel a commercial grade LED? You should be looking for onsite servicing for a minimum of 3 years for total peace of mind. What training / professional development is included? This is key and we have a section in this eBook dedicated to training. Budget? What budget….. of course price is the biggest driving factor for any tech decision a school or school district makes. It’s only when you analyze and compare all of the above that you get a good idea of the overall value of the package. Our experience is that smaller, specialist companies who are focused 100% on the Interactive Flat Panel, offer the best overall packages when compared against some of the more well-known household name brands. When beginning to shop for LED touchscreens, we decided to look at as many as possible before making a decision. Over the course of the summer we brought in or saw demoed at least 6 or 7 different models and manufacturers. We tried to take in various different factors such as hardware and software factors. Also important were items like sales and technical support as well as installation issues. 3. What size should we buy? I’m not quite sure who coined the phrase “bigger is better,” but when talking about Interactive Flat Panels this is definitely the case. What usually dictates this though is budget and what you have available to spend. Ultimately, I am sure it will come down to budgets that dictate the size of the Interactive Flat Panel that you purchase, but here are a couple of considerations to think about outside of the monetary cost. In our experience, the 78” Interactive Whiteboards that have been in your classrooms for the last 5 years are typically getting replaced with 55” and 65” Interactive Flat Panels. While you are sacrificing physical inches, you are gaining a lot of what I call real estate on the screen. To explain this further, most of the projectors that were being used with Interactive Whiteboards were 1024 x 768 resolution. The Interactive Flat Panels at a minimum are 1920 x 1080 resolution, so you are getting almost twice the page width in terms of pixels. If you opt for a 4K Flat Panel (I’ll cover this later) you are actually getting four times the resolution and four times the number of pixels than your Interactive Whiteboard had. Keep in mind that the image is a lot brighter than a projector. It has a much higher contrast ratio too, which means it is easier to see the smaller Interactive Flat Panel from the back of the classroom than it was the Interactive Whiteboard. When selecting a size of Interactive Flat Panel, you have to be mindful about teachers and students being able to reach the top of the screen. The bottom of the Interactive Flat Panel is normally at a minimum around 36” (90cm) from the floor. When you consider the physical size of the 85” for example, if you have it any lower than this then the students will not be able to see the unit, but any higher and the teacher will not be able to reach the top of the unit. I think this is another reason that the 65” has been so popular. 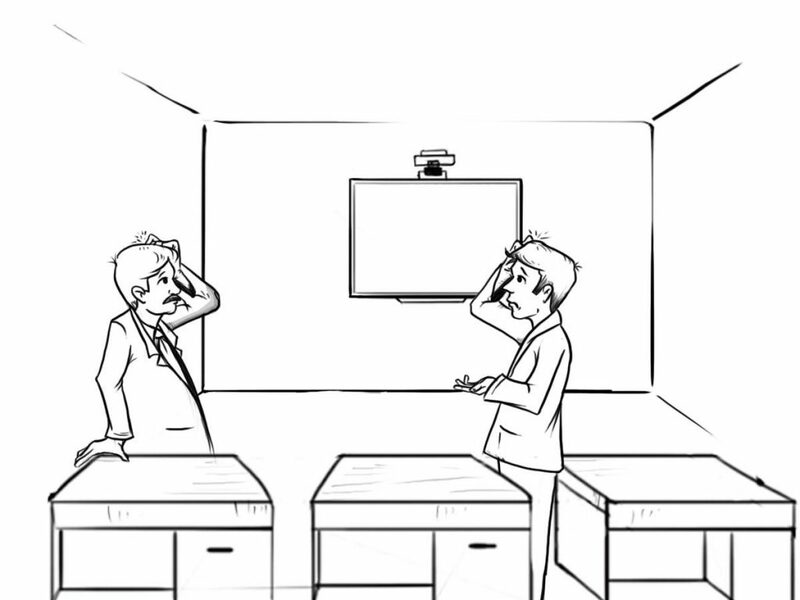 This short guide is an extract from the eBook “Bring Back My Whiteboard!” – Written by TouchIT Technologies CEO Andi Brabin. Enter your email address below to receive your free copy.